Allarmelu took out the sari that belonged to her mother, her mother’s mother, and her mother before that. All she wanted now was not a long chain of dead mothers but her mother, alive. She breathed deep, hoping for a waft of her mother’s musk. But this sari did not have the fragrance of sandalwood and frankincense mixed with turmeric. Her heart skipped a beat … The sari on her lap was an imposter! 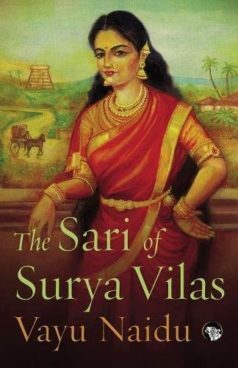 The Sari of Surya Vilas set in the Madras Presidency from 1857-1916 and Norfolk, England. The silenced stories woven in a wedding sari, and the emergence of the Oxford Dictionary is symbolic of freedom through woven story and language as identity. The novel was featured in Australia’s ABC Broadcast as Book of the week.